Are you making the most of returning visitors to your site? If not, maybe it’s time to create a website popup campaign to get their attention. If someone’s come back to your site a second or third time, they already like your content. That means it’s more likely that they’ll be happy to join your email list. All you have to do is ask. Why get them on your email list? So you can form a connection with them, and encourage them to visit even more. The stats show that people who return to your site are most likely to engage and buy. That means engaging repeat visitors is good for business. Here at OptinMonster, we often talk about segmentation and personalization in marketing. Differentiating between new and returning visitors is one of the easiest ways to get started with both. And it’s easy to do with OptinMonster. When new visitors land on your site, their browser collects a small file called a cookie. If that’s there when they come back, OptinMonster immediately knows they’re a returning visitor. That makes it simple to target a website popup campaign specifically to these visitors, and it can really pay off. Expat.com uses cookie detection to target returning users, and adds tens of thousands of new members to its site every month. 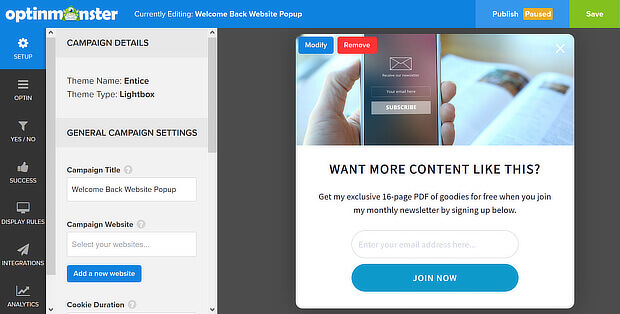 You can use this same functionality to grow your email list simply by welcoming back returning visitors with a website popup, and asking them to join. We’re going to show you just how to do that. Here’s the campaign we’re going to create. 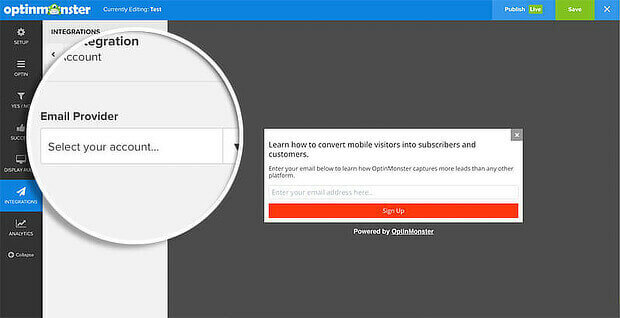 First, you’ll need to get OptinMonster to use this campaign to get more leads and subscribers. Then follow these steps to start engaging returning visitors. Login to your OptinMonster account, and press the green Create Campaign button. Choose a campaign type. We’ll use the Lightbox campaign, an attention-grabbing campaign that converts well for OptinMonster customers. Choose a theme. We’ll use Entice. Next, give your campaign a name that’ll help you to recognize it later. You can also add the website where you plan to use the campaign at this stage. Press Start Building. This’ll take you to the OptinMonster campaign builder where you’ll see the default Entice campaign. The first step is to replace the default image with an image that relates to your campaign. To do this, click on the Modify button on the image. 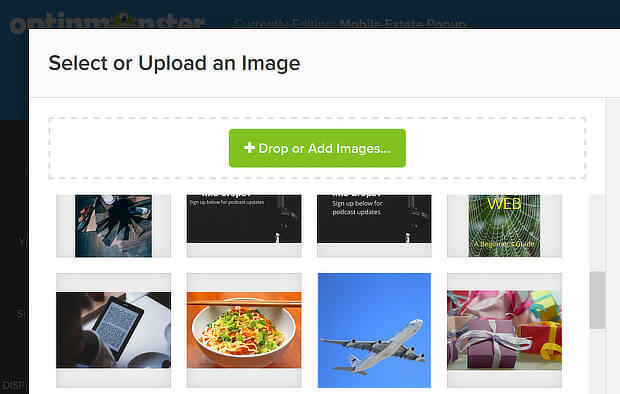 You’ll go to the image gallery, where you can choose an image you’ve already uploaded. If you don’t have a suitable image, check out our list of Creative Commons image sites, and grab one from there. Next, click on the default headline text, and change it to something welcoming. We’ll use “Welcome back – can we keep in touch?”. Use the popup editing toolbar to change font size and formatting if you wish. It’s a good idea to save your campaign at regular intervals. You can do that with Save button at the top of the screen. Repeat this process for the body text. The next step is to edit your email signup form. First, click on the email field. That’ll take you to the Email Placeholder menu item, where you can edit the placeholder text. Click on the Join Now button to go to the Submit Placeholder. As before, you can edit the text and the button color. 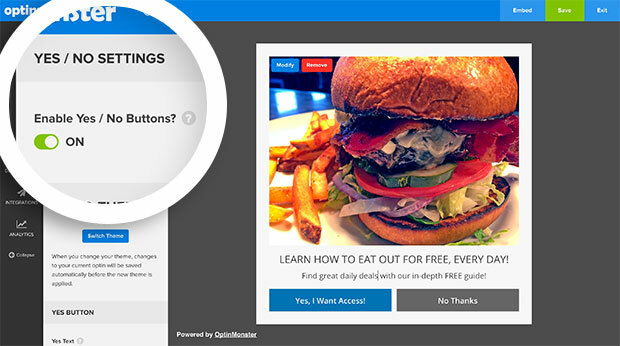 Consider adding a visual display effect so your website popup gets more attention. Go to Design Fields » Display Effect, and choose one of the available options. You can also scroll down to Sound Effect, and choose one of those to provide an audible alert when your website popup shows. It’s a great way to make sure visitors don’t miss your popup. Next, it’s time to set display rules. These will control when your website popup shows and who sees it. By default the After ‘X’ seconds display rule is enabled. If you want to wait a little longer before you show the popup, increase this time slightly. We’re leaving it at 5 seconds, which is the default. 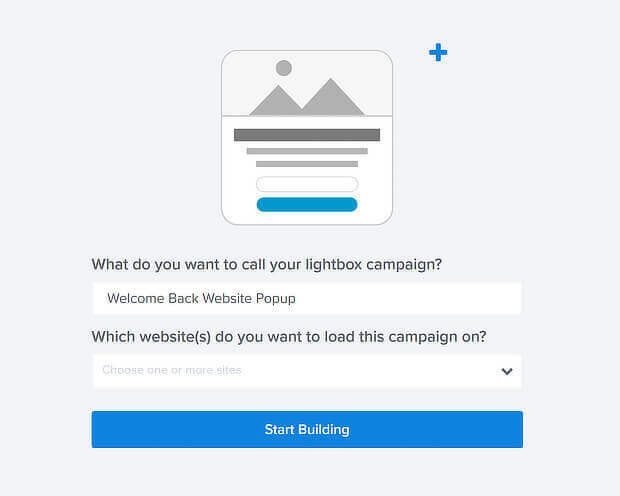 Now it’s time to make sure only returning visitors see your website popup. 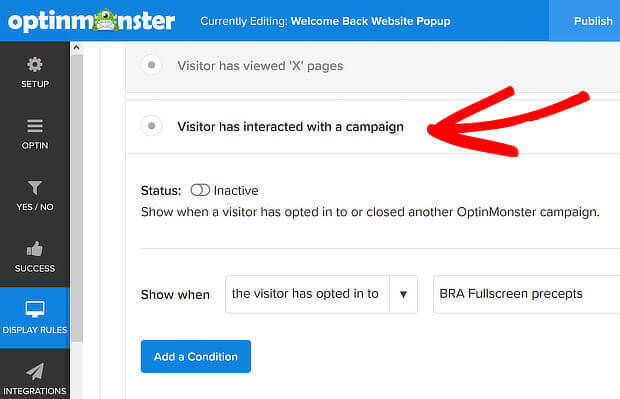 OptinMonster’s advanced targeting makes this easy. 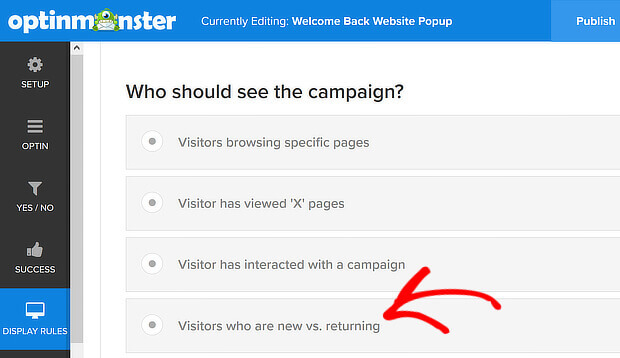 Go to Display Rules » Who should see the campaign » Visitors who are new vs. returning. Click the toggle to enable this display rule. In the dropdown area, you’ll see the words “Show when the visitor”. In the box next to it, select is returning. Now, only returning visitors will see your welcome back popup. 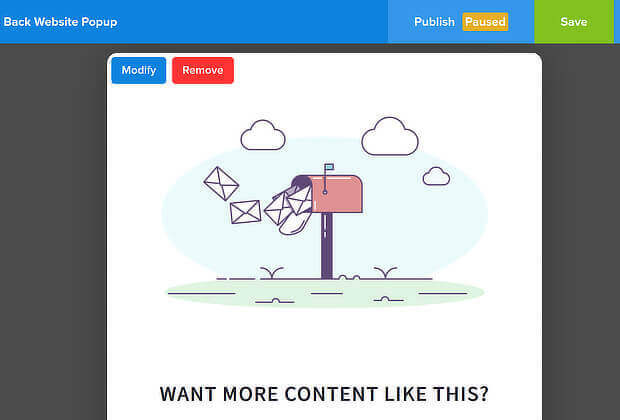 You’ll need to add an email integration if you want to grow your list. 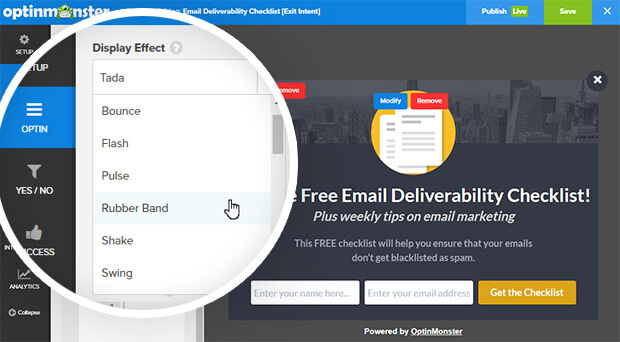 OptinMonster integrates with all major email marketing services. 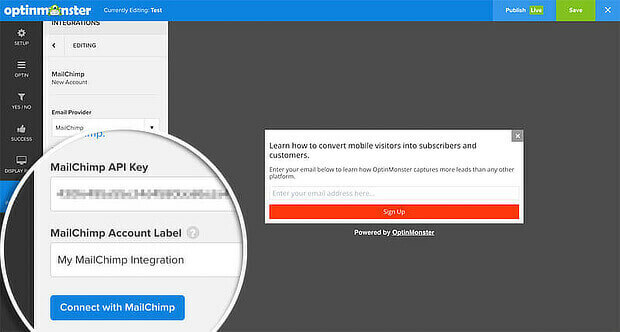 Here’s how you add MailChimp. To do this, go to Integrations » New Integration » Email Provider. Choose MailChimp. Next, add your MailChimp API key. Name your integration, then click Connect with MailChimp. Then, go to Email Provider Account. Choose the MailChimp email list you want to add subscribers to. If you wish, enable double opt-in so subscribers have to confirm that they really want to be on your list. 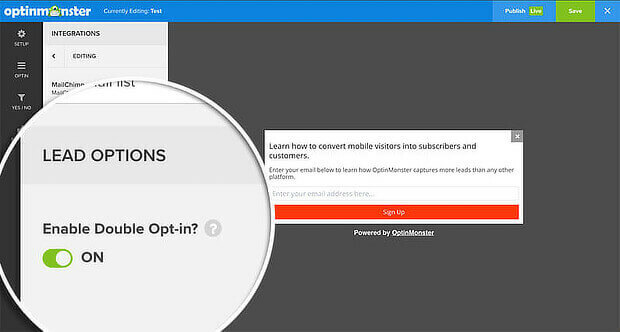 If you’re using another email marketing service, check out these instructions for other OptinMonster integrations. Once you’re finished, it’s time to publish the campaign. To do this, click the Publish button at the top of the screen. On the next screen, you’ll see a toggle. Click it to make the campaign live in the OptinMonster app. You can also add your website now, if you haven’t done it yet. Scroll down the page. OptinMonster offers a range of publishing options. 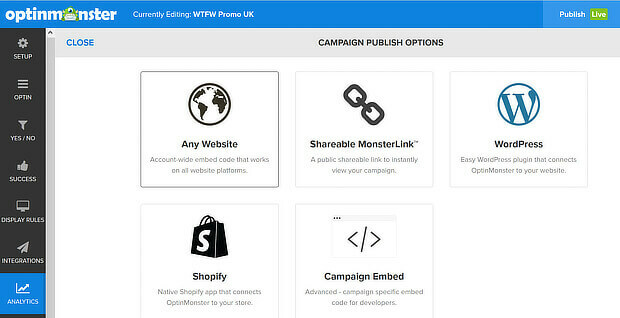 For instance, you can publish campaigns to WordPress or Shopify. 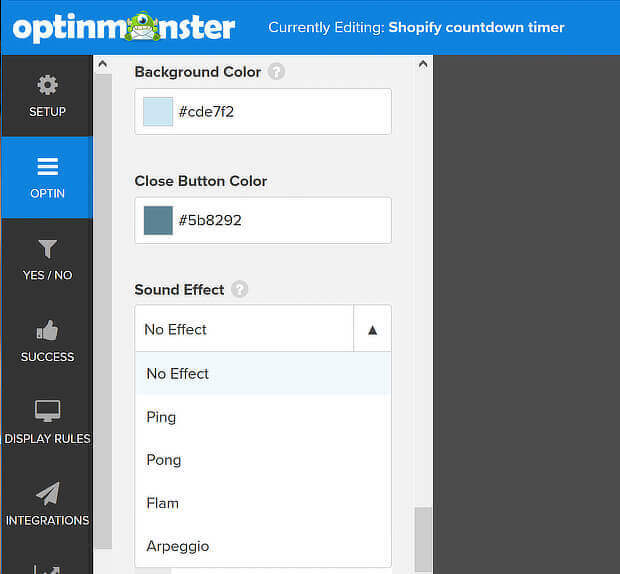 Here’s some more guidance on embedding OptinMonster on your site. Here’s a fact of marketing life: not everyone’s going to opt in to your first campaign. 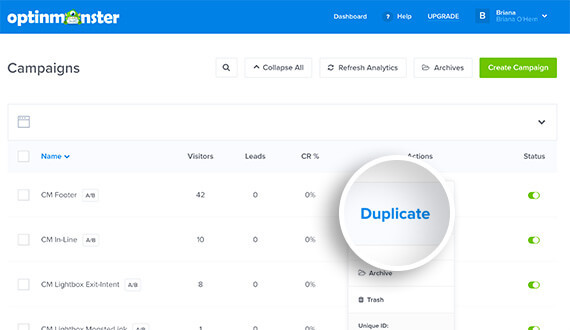 But you can improve your chances of getting signups from returning visitors by running another version of the same campaign just before they leave your site. This uses OptinMonster’s advanced Exit-Intent® technology which is proven to work. Here’s how you do that in a couple of easy steps. 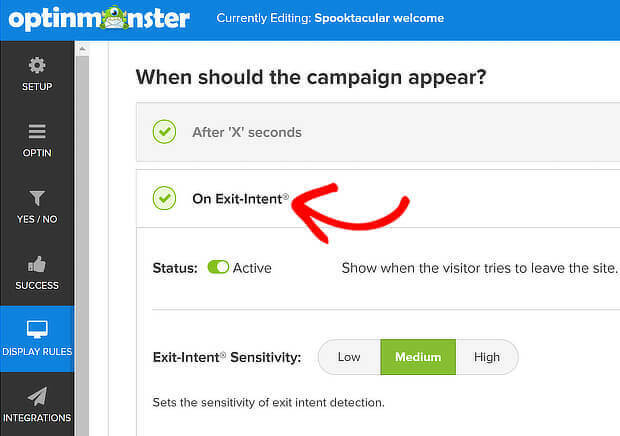 First, go back to the OptinMonster dashboard, and click the three-dot menu next to the campaign you just created. Click Duplicate to create an exact copy of the campaign. We’re just going to make a couple of tweaks. 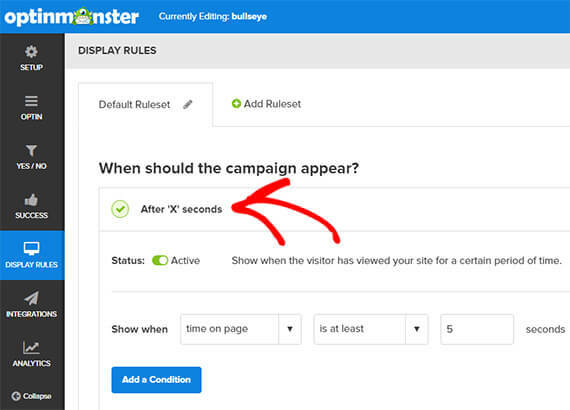 Then, go to Yes/No in the campaign builder and click the toggle to enable this feature. Yes/No forms use the Zeigarnik effect. This means when people click yes, they’re much more likely to subscribe. When you enable Yes/No, you’ll see two buttons where the email form and submit buttons were. Next, choose what the buttons do. By default, your visitors will see your campaign with the email signup form after clicking Yes. Another popular option is to use the Yes button to redirect users to a new page, but we’re going to leave the default setting in place. The next step is to go to the Display Rules. Disable the other rules, and enable On Exit-Intent®. This will show the campaign when people are about to leave your site. 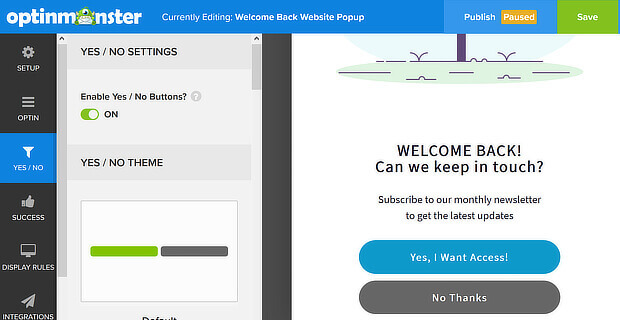 You also want to make sure you’re not annoying visitors who’ve already opted in to your welcome back website popup. To do this, Go to Display Rules » Who should see the campaign? Enable Visitor has interacted with a campaign. There are two boxes that affect what will happen. In the first, change the options to Visitor has not opted into. In the second, choose the name of your original campaign from the other dropdown box. Here’s an example of how that looks. That’s it! 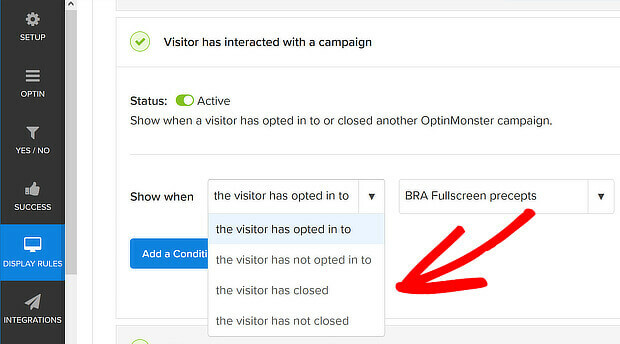 You now have a slightly different version of your campaign to show to returning visitors who don’t opt in to your original campaign. 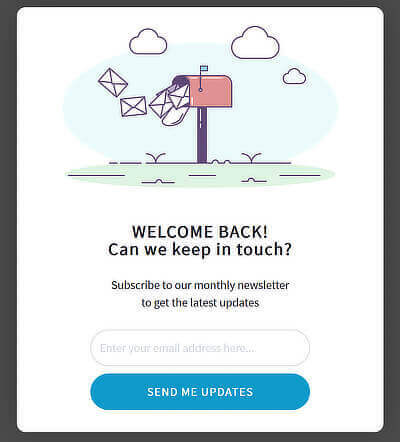 Now you know how to get the attention of returning visitors with a “Welcome Back” website popup. Next, learn now to target mobile users with a popup after inactivity. You can also get inside your visitors’ minds with a WordPress survey popup. And don’t forget to follow us on Facebook and Twitter for more tutorials, tips, and in-depth guides. I just followed the steps and got a Welcome Back lightbox setup on my blog.